Puente del Inca (Spanish "The Inca Bridge"), is a natural arch that forms a bridge over the Las Cuevas River, a tributary of the Mendoza River. 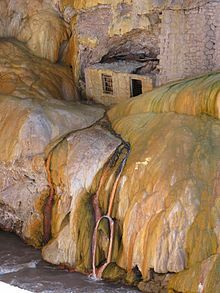 It is located in Mendoza Province, Argentina, near Las Cuevas. The nearby hot springs are also named Puente del Inca. Both glaciers and the hot springs were involved in the formation of the arch. During an ice age, glaciers would have expanded down throughout the entire valley; then, at the end of the ice age when the Earth began to warm up again, the retreating ice would have left behind massive piles of eroded debris. The water that flows from the hot springs is extremely rich in mineral content, to the point that it has been known to petrify small objects in a layer of minerals. Similarly, the piles of debris left by the glaciers were encrusted over time into a single solid mass. Finally, during a period where the climate was extremely wet, a powerful river formed in the valley. It cut a channel through the lower, least encrusted layers of debris, which gradually eroded into the large opening of the arch. In March 1835, Charles Darwin visited the site, and made some drawings of the bridge with large stalactites. In the early 20th century there was a large thermal resort and spa that used the hot springs to cure certain illnesses (a spa still survives further down the river at Cacheuta). There was a railway station, which is still standing, and tourists arrived by train to the resort. This was one of the last Argentine stations of the Transandine Railway before the train continued into Chile, traveling through a long tunnel under the Andes. The area is located between the two trail-heads for climbing Aconcagua, the highest mountain in the western hemisphere. The abandoned railway station has been turned into a mountaineering museum (the "Museo del Andinista"), founded by a group of mountain climbers from Rosario to display the cultural history of the area. The museum is open to the public during the summer and is run by the founding group of friends. Situated at 2,740 m (8,990 ft) above sea level, Puente del Inca has a cold semi-arid climate (BSk, according to the Köppen climate classification), with moderate summers and snowy winters. Despite its classification as a semi-arid area, the area has a continental temperature profile, i.e., that at least one month sees an average temperature above 10°C and at least one month sees an average temperature below 0°C. This is due to its strong Andean influence, far distance from its nearest ocean (being the Pacific Ocean, which in turn helps bring moisture and the area's precipitation) and its high altitude. Nonetheless, this type of climate is extremely rare to both South America and the Southern Hemisphere, since it can only be found on other spots who are located in mountains with profoundly prominent altitudes. ^ a b c Scheffel, Richard L.; Wernet, Susan J., eds. (1980). Natural Wonders of the World. United States of America: Reader's Digest Association, Inc. p. 306. ISBN 0-89577-087-3. ^ "Datos Estadísticos (Período 1971-1980)" (in Spanish). National Meteorological Service of Argentina. Retrieved August 23, 2012. Wikimedia Commons has media related to Puente del Inca. This page was last edited on 1 November 2018, at 18:23 (UTC).